I recently acquired a copy of the new book, Rock Down, Coal Up – The Story of the Quincy and Torch Lake Railroad by Chuck Pomazal. It did not take me long to read the whole book, cover to cover. I have always thought the Q&TL was an interesting little industrial line and, to some extent, my Peshekee River Railroad was inspired by the Q&TL. This new book brings forth many finer details about the Q&TL that show a small industrial narrow gauge layout can have a lot of character and modeling potential. The Q&TL was a 3 foot narrow gauge railroad that operated 6 miles of main line in the copper country of Michigan’s Upper Peninsula. 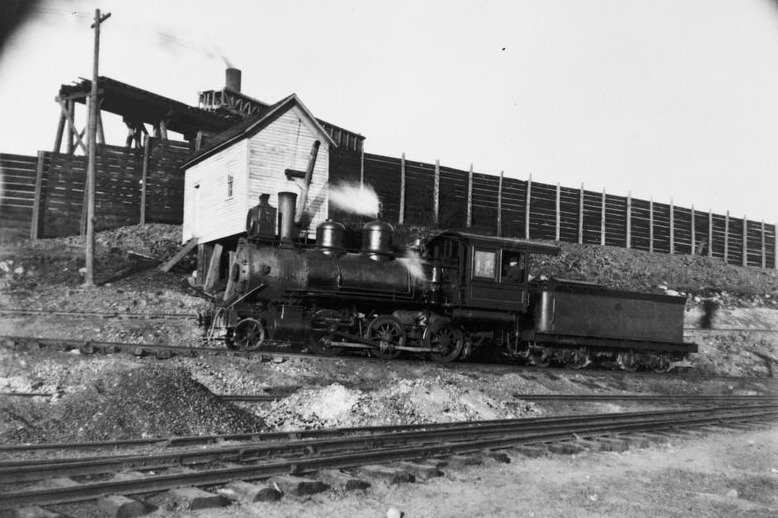 The purpose for the railroad was to move copper bearing rock from the mines on top of the hill above Hancock to the mills The railroad operated from atop the hill above Hancock and ran the six miles to the mills on Torch Lake. On the return trip, the railroad would bring coal back up the hill to the boiler houses that kept the hoists and other equipment running. At first glance, it appears that there is not much to the operation of the railroad with the same cars going back and forth with either rock or coal. A closer look at the complex track arrangements and learning of the multiple expansions show that there was quite a bit to this little railroad. What is most appealing (at least to me) is how most of the equipment is so well documented. This is because when the line stopped in 1945, the equipment was just left where they ended the day. Most of the equipment stayed where it was for almost 30 years before most of the equipment was removed. 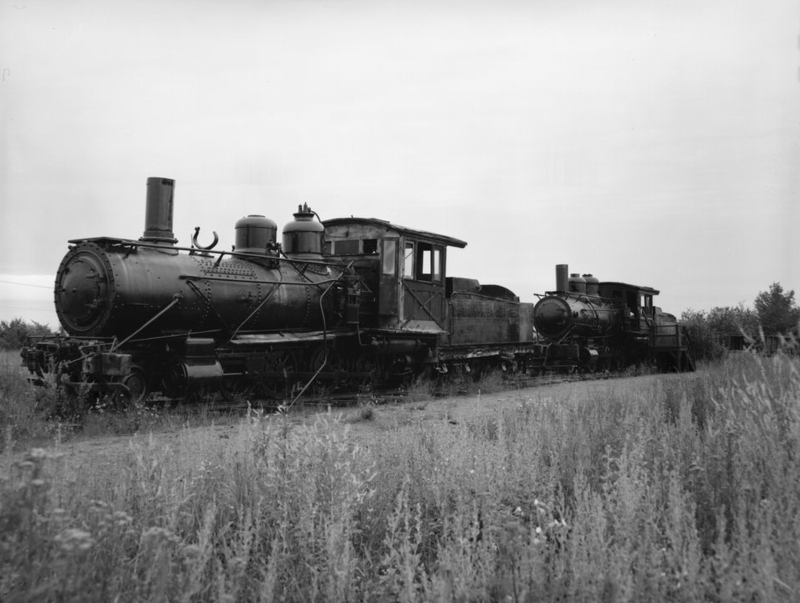 Even today, two of the original steam locomotives are still on the property and have been moved to a location that is safe and available to visitors to the site. Locomotives on display near hoist house. The six miles of main line consisted of a 1.5% grade from the top of the hill to the mills on Torch Lake. There was also a 3.5% switch back to access the coal docks at water level. 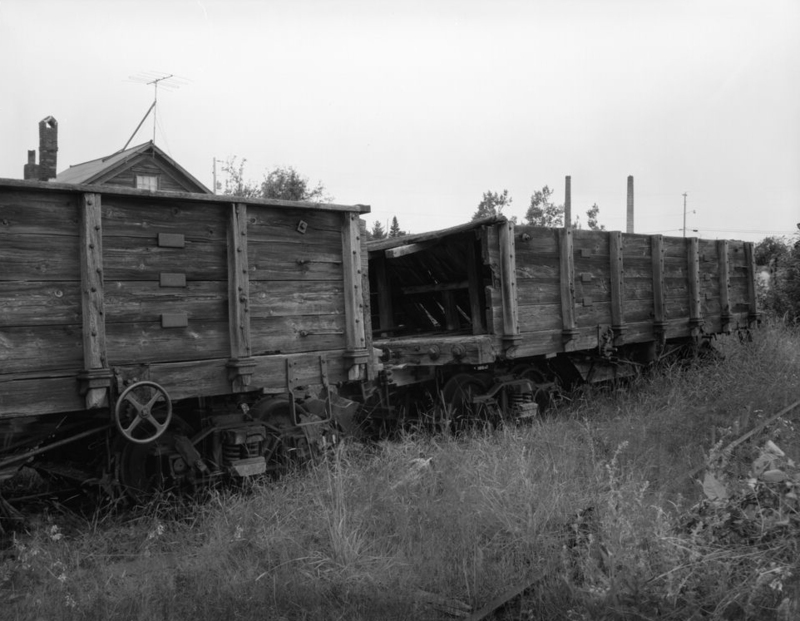 The same drop-bottom cars (referred to as rock cars) were used for hauling coal back up the hill to the boiler houses. At the top of the hill above Hancock there were several mine shafts. These shafts had been expanded and new shafts opened over the years. There were also boiler houses, hoist houses and various other mining support buildings. This created a maze of tracks to collect the rock, weigh it and then move it to mill at the lake. On the return trip, the rock cars with coal would have to be shuttled to various points to feed the furnaces at up to five boiler houses and the coal shoot for the locomotives themselves. Rock Cars stand where they were left when the mine closed. Several factors make this railroad a fine subject for a small model railroad. The average length of a train would have been 12-15 cars. Larger trains were run on occasion, but only after the last locomotive, a Baldwin 2-8-0, was added to the roster. The cars were short at no more than 24′. The line did transfer other cargo periodically as the line also had several flat cars and a couple gondolas. These were in the range of 30′ cars. The line had a few cabooses, but no two were alike. they ranged from a very short bobber to an old passenger car that was shortened and had a copula added. 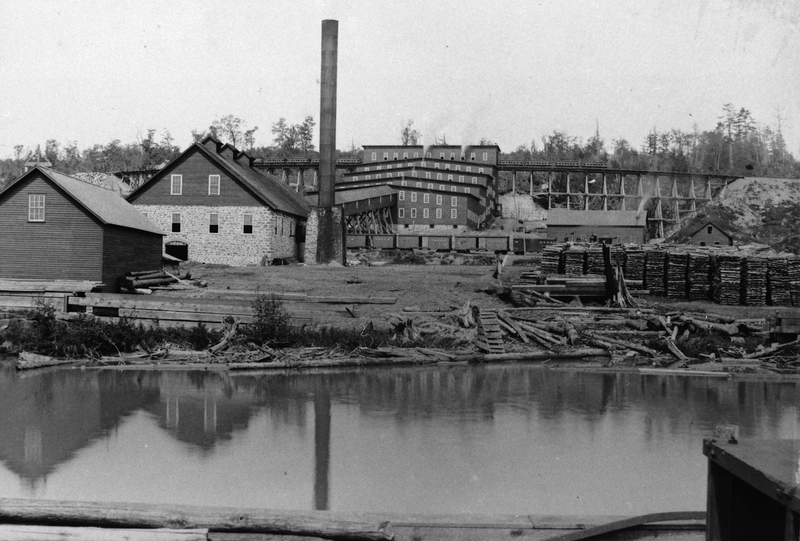 No 1 Mill circa 1890 as viewed from the lake. Note the trestles entering the building from each side. Although the northern Michigan scenery is very beautiful, Modeling the Q&TL would not require expansive vistas. The railroad was built on the side of the hill, so the railroad can be modeled with a natural backdrop of the hill. As shown in the book, even the top of the hill had some natural and man made scenery blocks. 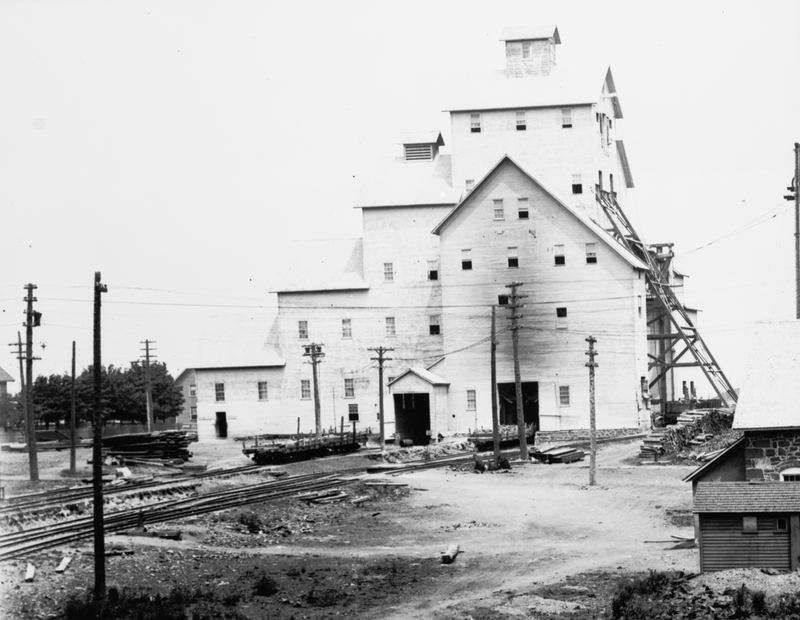 Most of the mining building were large and flats could be utilized for most. i also found it interesting that some of the snow fences were made from very tall poles with 10″ wide boards applied to create a very tall wall. This would also serve very well as a backdrop/view block. Q&TL Mogul at work in Hancock. Note the square water tank and the snow fence in the background. Unique buildings and equipment also make the Q&TL very unique. The round house was built in several stages and the walls are made of local stone cast of during the mining process. The original turn table was a 50′ armstrong model. The water towers were square, enclosed and of unique design with horizontal internal tanks. There were several styles of rock cars, but all functioned in a very similar fashion. Most also used shorter wheelbase trucks. Most of the locomotives were 2-6-0 moguls but there was a couple 2-8-0’s. One of the 2-8-0 locomotives was an outside frame locomotive that had twice the pulling power of the Moguls. This was locomotive #6. The outside frame reminded me of some Colorado narrow gauge locomotives. Getting back to the book, Chuck Pomazal has assembled a wealth of information and history about the Q&TL. The book includes scale drawings of all the rolling stock and locomotives. there are also drawings of key buildings like the roundhouse. The book includes many photographs of the line both while in service and after abandonment. All in all I highly recommend the book even if you do not plan on modeling the Q&TL. The details within the book inspired me to add little bits to my Peshekee River Railroad to give it some additional character. The book may be purchased from the Quincy Mine Hoist Association. A portion of the proceeds goes toward the Locomotive Restoration Fund. Today, locomotive #6 is being restored and is located at the refurbished roundhouse in Hancock. The Quincy Mine #2 Shaft House, Hoist House, Round House and several other building are part of the Quincy Mine and Hoist : Keweenaw National Historical Park. I highly recommend a visit to the mine and the wonderful G Scale layout they have that represents the Q&TL. I would have missed that this book was available- I had looked for info about this line a few years ago while dreaming about a narrow gauge layout. Thanks for sharing! What can I say, a good book deserves a good plug!